When did you last experience a true performance? Not one of those musically perfect but soulless concerts by a celebrity maestro and a touring orchestra - Edinburgh yesterday and Salzburg tomorrow - that is more restatement than performance. I mean a real performance, a one-off where routine is traded for risk, where the musicians become players in a drama, an event which, to paraphrae Carl Nielsen, gives us something else, gives us something new, instead of expressing deedless admiration for the conventional. Canadian composer, educator and sound ecologist R. Murray Schafer declared that art should be dangerous, and he would surely approve of last night's Earthquake Mass at the Aldeburgh Festival. Antoine Brumel's Missa Et ecce terrae motus is known as the Earthquake Mass because it is based on the Easter Plainchant from Matthew 28:2: 'And all at once there was a violent earthquake'. Its innovative twelve part writing makes the Earthquake Mass one of the earliest examples of immersive music - what is now known as headphone sound - and when first performed in the early 16th century Brumel's masterpiece must have seemed very dangerous art indeed. The mass was championed by Orlando de Lassus who had it copied for performance at the Bavarian Court in the 1560s. But the only surviving manuscript is damaged and incomplete; so for last night's Aldeburgh performance contemporary vocal ensemble Exaudi and sound artist Russell Haswell used that incompleteness as a remit to create dangerous art. Three movements of the mass, the Kyrie, Glora and Sanctus were sung with Russel Haswell's electronic infrasound providing a ground bass - in the true sense of the word. For the Agnus Dei, where the extant manuscript has rotted away, singers and sound artist dispensed with the safety net completely and combined in a multi-sensory recreation of the apocalypse. In an immensely powerful coup de théâtre, as each singer reached the point in the Agnus Dei where their part had rotted away, they left the stage, and Brumel's sublime polyphony was gradually engulfed by Russell Haswell's electronic noise. With the stage empty the Earthquake Mass ended in a multi-media apocalypse that left the capacity audience in the Britten studio shaken and distinctly stirred. Exaudi director James Weeks deserves considerable credit for coming up with the idea for a multi-sensory Earthquake Mass, and sound artist Russell Haswell deserves considerable credit for daring to bridge the gap between tradition and innovation. But, above all, outgoing Aldeburgh Music chief executive Jonathan Reekie deserves maximum credit for bringing the project from proposal to triumphant realisation. Recently I was working with a collaborator on a meaty and complex music related project. In fact the sheer complexity prompted me to express concerns about the viability of the project. In response my collaborator emailed saying: "It is a large but, well, are we going to be all BBC Radio 3 and imagine the people can’t cope?" Jonathan's great strength in his tenure at Aldeburgh was an unshakable conviction that audiences can cope, and that is a strength that, sadly, is found very rarely in classical music today. Classical music's real problem is not elitism, sizeism, or any of the other fashionable isms. The real problem is a mistaken conviction that audiences can't cope with any music that is remotely challenging. To many people, Jonathan Reekie's decision to green light the Earthquake Mass for the Aldeburgh Festival would have seemed unwise. But it sold out a late night performance against the very considerable competition of BBC TV coverage of England losing yet another World Cup soccer match. The Earthquake Mass was featured on the BBC's flagship World at One radio programme, giving classical music a very healthy dose of positive PR to offset the recent revelations of abuse and size discrimnation. And the appreciative reception by the Aldeburgh audience was one of the most vocal I have heard for a very long time at a classical concert. Much of the thinking behind the Earthquake Mass parallels recent threads here - sound shaping, immersive sound, paradigm shifts etc. Heavens forbid that every concert is turned into an electronic apocalypse. But classical music desperately needs good new ideas that will help attract new audiences. 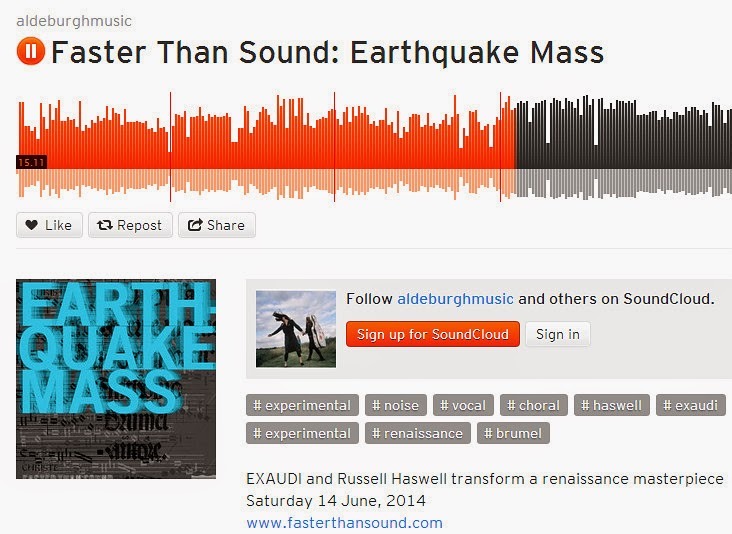 The Earthquake Mass as performed by Exaudi and Russell Haswell is overflowing with big new ideas that work, and that can be repurposed and applied in more nuanced ways. For this reason I suggest it replaces yet another self-serving speech by a so-called industry expert as the keynote event at the next Association of British Orchestras annual conference. 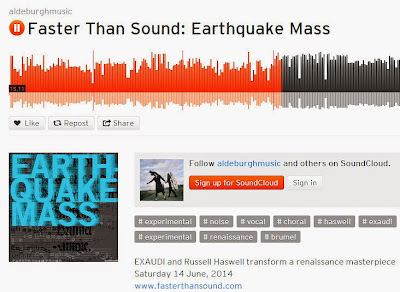 The experience of the Earthquake Mass can be sampled via Soundcloud. But you will need a wide bandwidth audio system to experience the danger. My ticket for the performance was bought at the box office. Any copyrighted material is included as "fair use", for the critical analysis only, and will be removed at the request of copyright owner(s). Also on Facebook and Twitter. A late night performance of the Earthquake Mass at the 2015 BBC Proms, where Russell Haswell's electronic noise could run riot in the huge space of the Albert Hall, seems an obvious next step.